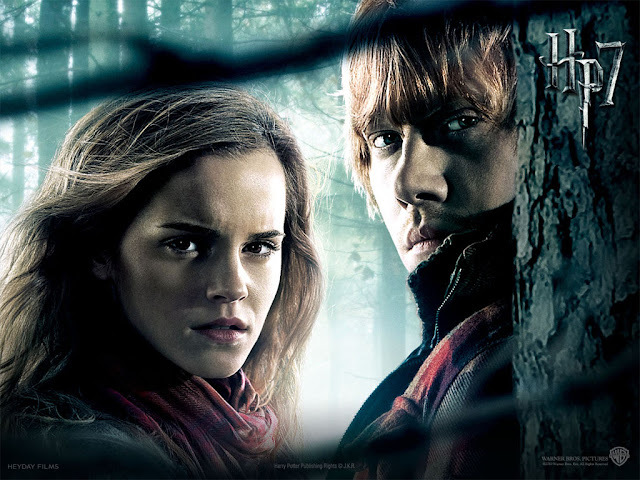 S.K.SAINI: Harry Potter and the Deathly Hallows *spoilers if you haven't read the books* With movie posters inside! 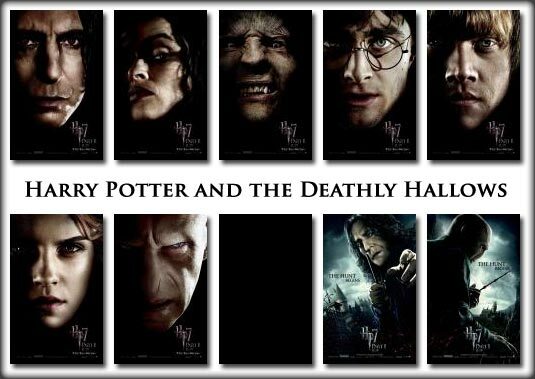 Harry Potter and the Deathly Hallows *spoilers if you haven't read the books* With movie posters inside! After 13 years, it is finally ending. From the best all time popular books to movies, it is ending. After growing up with it my whole life, it is finally ending. *sighs sadly* I can't even begin to express my feelings right now. But I guess I'll try and get it all out. As it slowly ends, a part of me slowly starts dying in the inside. Like the rest of the world, who has grown up with Harry Potter and his amazing adventures and life, a part of us is ending too. For those who read my blog, will know that I am Harry Potter obsessed, I know every little detail about it, I have read the books more than 30 times each. That's right, EACH! Okay, I remember reading the books when I was 9 years old. It was amazing, and I was a real bookworm. I fell in love with the book the moment I finished reading it. It became a part of me and the rest of the world. J.K.Rowling, you made my childhood as well as everyone else. So, now it's ending, our childhood is ending. 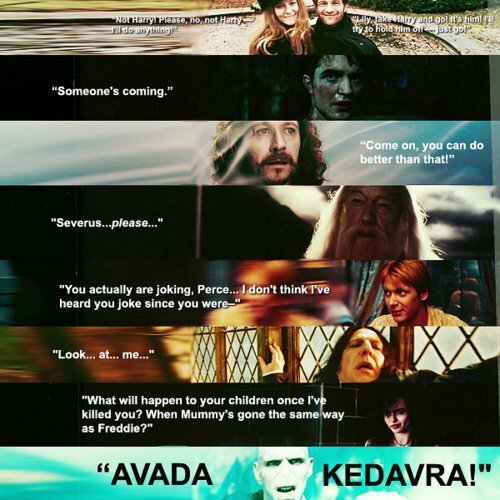 For those who have read The Deathly Hallows, knows exactly what happens. I wrote spoilers on here, because anyone who hasn't read the books, and don't like to be spoiled, I suggest you don't read any further. For true Harry Potter fans who have read the book, read along and feel the emotions roll with me. So...the finale. All the books have lead Harry and us to this point, this is where is all comes to. 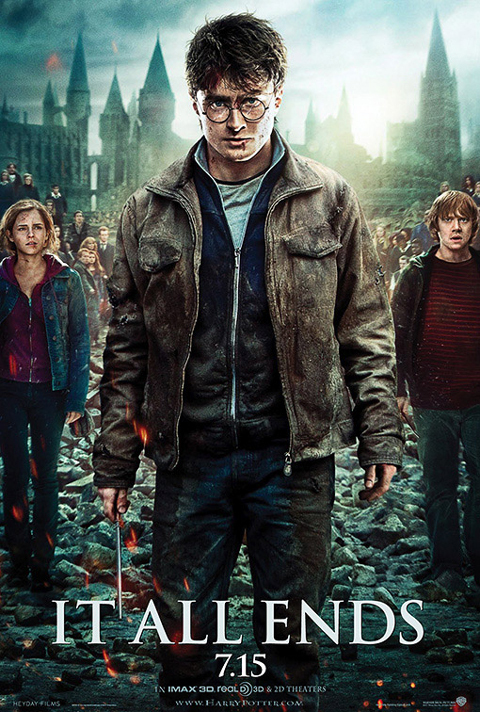 Harry leads us on a journey on finding the horcuxes, and destroying them all to finally defeat Lord Voldemort. But there is a catch, and he doesn't know it too, not until the end. So what are horcruxes? It is a dark magical object to give yourself immortality. A part of your soul will get ripped out and go into an object or living organism of your choice. But there is a catch to live forever, you have to kill in order to make them, it is the 'supreme act of evil' when one commits murder. Tom Riddle wanted to live on forvever so much, that he made 7 horcruxes. That's right, seven! Imagine ripping your soul into seven pieces, and storing them in objects/living organisms. But by accident, he made 8 horcruxes. 1. 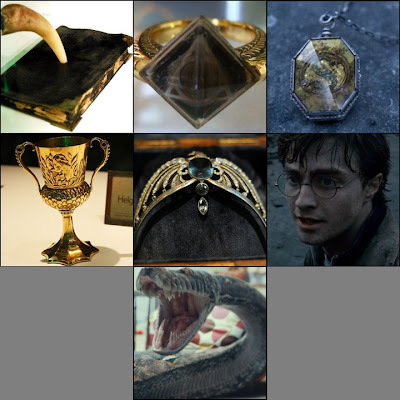 The first Horcrux is Marvolo Gaunt's Ring. Marvolo is Tom Riddles maternal grandfather. In fact, Tom Riddles full name is Tom Marvolo Riddle, which he despises so much. 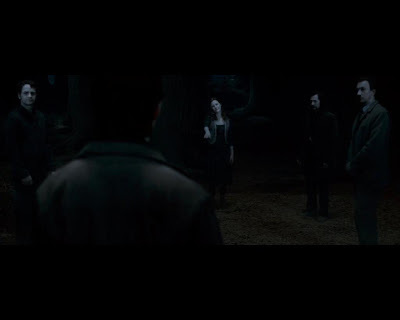 His name Tom Riddle is the name of his father too, who was Tom Riddle Senior. 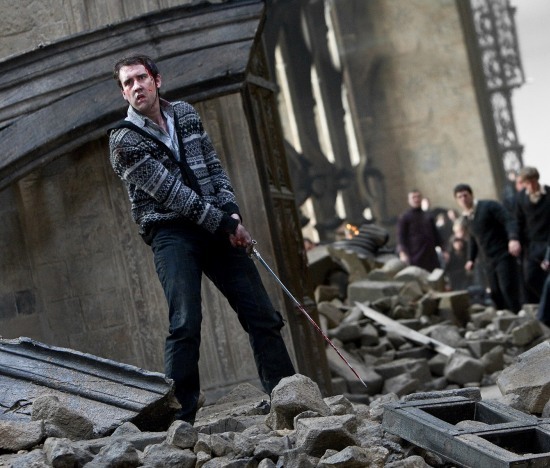 It was already destroyed by Albus Dumbledore, hence why his hand was poisoned, which led to his death. It was first shown in Half Blood Prince. 2. Tom Riddles Diary. Which everyone should remember from Chamber of Secrets, where Harry saved Ginny. Do you remember when Tom Riddle was there? The teenage gorgeous version? That was a Horcrux, that was part of Voldemort's soul. And when Harry destroyed the diary with the Basilisk fang, it destroyed Tom Riddle too, hence destroying the Horcrux and the first part of Voldemort's soul. It's amazing how all the movies come together eh? And it was only the second one! 3. Helga Hufflepuff's Cup: This was actually shown in the book with The Half Blood Prince. But unfortunately the movie didn't show most of the most important bits. It was used as the third Horcrux, because Voldemort loves everything to do with Hogwart, it was like Harry, his home, a place where he could be himself. And having a part of himself in one of the founding members, was priceless. Literally. I have no idea how they are going to mention it in the second part of the movie, but we'll see. 4. Salazar Slytherin's Locket: This locket was first mentioned in Order of the Phoenix (a heavy locket which none of them could open), but it was shown in The Half Blood Prince when Harry and Dumbledore went to the caves, across the inferi-infested waters, and found the locket in the poisoness basin. There was a letter inside from Regulus Black (Sirius's older brother who was a Death Eater) saying that has destroyed the real locket, and replaced it with a fake. So that was also destroyed. 5. Rowena Ravenclaw's Diadem: Another object from one of the founding members of Hogwarts. It was her tiara. It is first mentioned in passing in The Half Blood Prince, when Harry goes into the Room of Requirement to dispose of the Potion's book from Snape, it is mentioned as 'an old discoloured tiara,". 6. Harry Potter. Yes, he is a Horcrux. It was an unintentional act done by Voldemort. He himself doesn't know he made Harry a Horcrux. 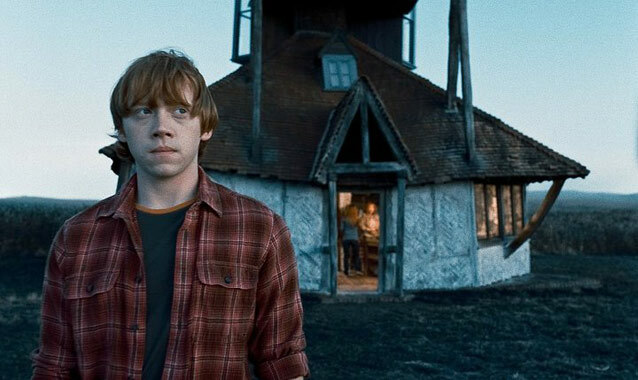 It was the night he killed Lily and James. 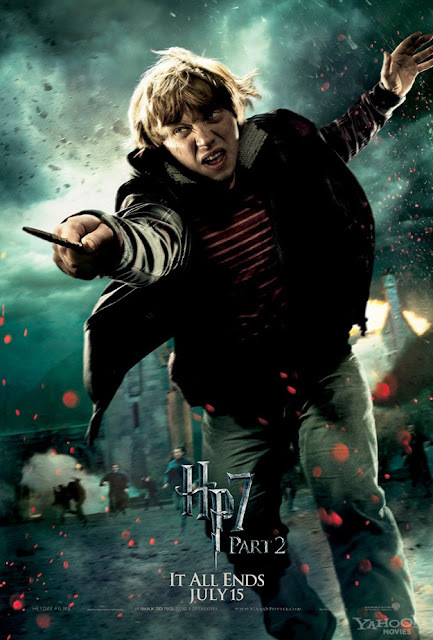 He was intending to make a Horcrux by killing 'The Chosen One', but instead the killing curse backfired, and when Voldemort was torn apart, a piece of his soul went into Harry. Hence, why Harry Potter can speak Parseltongue, see into Voldemort's thoughts, know what he is feeling. 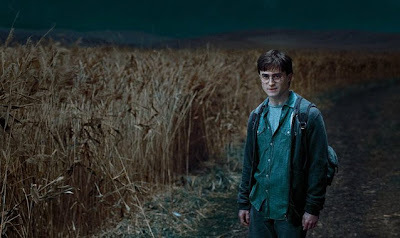 Throughout the whole series, the reason why Harry's scar hurts, is because of what Voldemort is feeling, and that piece of soul inside of him wanting to go back to it's master. 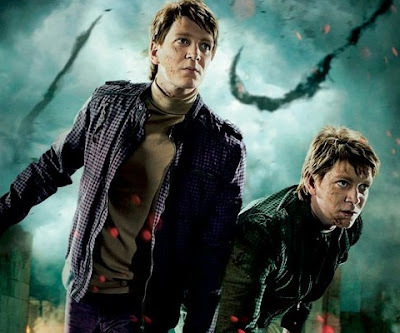 When Voldemort tried to kill Harry again near the end of The Deathly Hallows, he killed a piece of himself, by accident. A false move from the infamous Tom Riddle. 7. Nagini: She is Voldemort's most beloved organism. She is his snake. 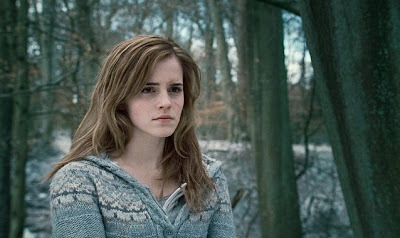 She is destroyed by Neville with Godric's Griffindor's sword. 8. The 8th and final Horcrux is Voldemort himself. That last piece of soul inside of him. Destroy the Horcruxes, finish off Voldemort for good. 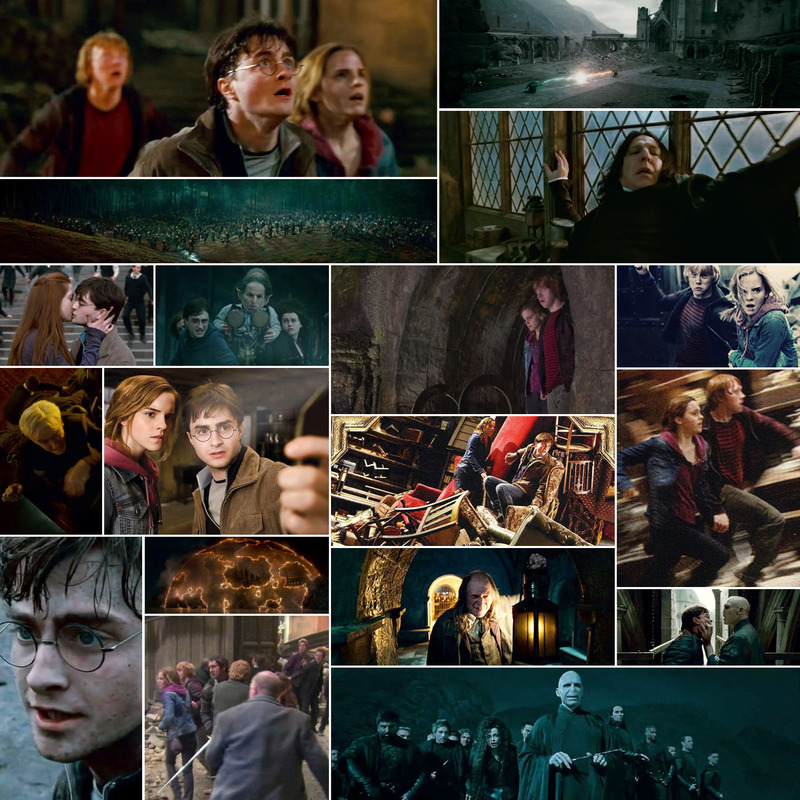 As we grew up with Harry Potter, we feel what he feels, we see what he sees, all our senses tingle with Harry James Potter. That sounds stupid, but that's how obsessed I am. I know so much about it, it makes me happy just knowing I have grown up with this. The Deathly Hallows. Of course anyone who has read the book and seen the movie will know what is about. 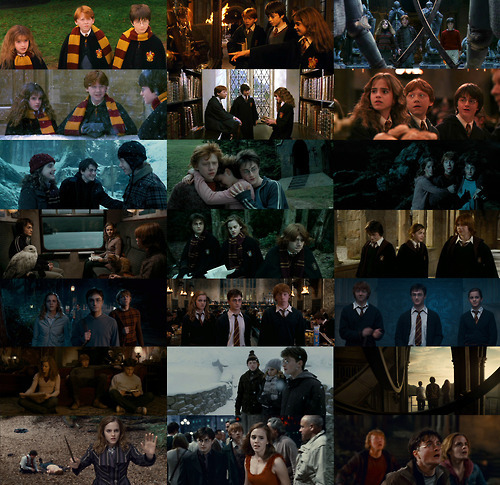 All three are seen throughout the whole series of Harry Potter. For those who haven't seen the movie or read the books will be shocked. All three objects together, will make you the most powerful Witch or Wizard in the entire world. Harry: "You'll stay with me?" 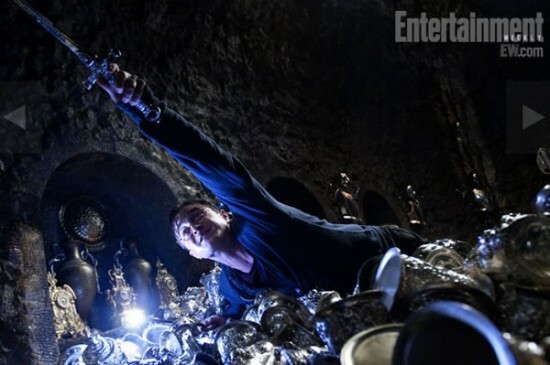 - James: "Until the very end,"
Possibly the most awaited scene in the movie EVER! Seriously, this moment is so iconic and heart-stopping, I'm pretty sure everyone including myself is going to be bawling their eyes out at this scene. Anyone who has read the book, will know EXACTLY what scene this is. I CAN'T WAIT!!! 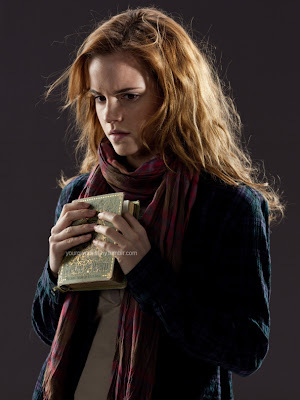 Seems like Hermione has already been in the Chamber of Secrets! AND TWO MORE!!! Because I know this might be too long for you guys and you might be getting annoyed by now. Last but not least, this is the letter that Alan Rickman himself (Severus Snape), wrote to J.K.Rowling. It is such a moving letter, because we can also feel how emotional Alan is about the series and how much he loves it. "Never can live, while the other survives,"
Hey Mind! its great you included Alan Rickman's letter, it is on this blog/website i've heard of it. It brought a little lump in my chest keeping my self not to cry which my sister and I do a lot every time we mentioned Snape's name ~ until now. I must admit the I have grown to love the character, the actor and the man.